Wonderful artwork! 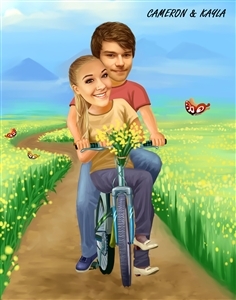 I love this one of my son and his girlfriend. I ordered two recently. The other was for an office of 29 people, we had a few adjustments before getting the final but myDaVinci was very easy to work with and patiently made adjustments and sent back until it was perfect. This is the second item that I have purchased from my DaVinci and it certainly did not disappoint. The artist did a fantastic job with the photos submitted and even accommodated a color change request. Love it! 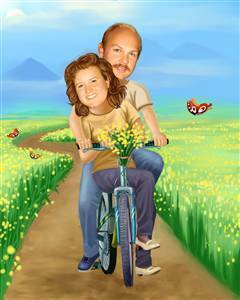 I had a caricature of my aunt and uncle done as a gift for my aunt after my uncle passed away. The artwork was amazing! The entire process from when I ordered to when I received my artwork was amazingly quick.....I would definitely use my Davinci again. Amazing and worth every penny! 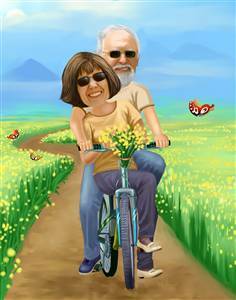 I ordered the "riding through the fields" caricature as a funny gift for my husband for our wedding anniversary. I was more than pleased with the product we received. 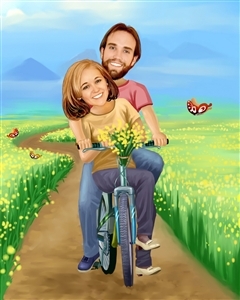 The artist made our faces look exactly like our picture, if not better! The colors came out amazing and so vibrant. I even asked them to alter the original image and they were able to produce not one but two amazing products within just 1 1/2 weeks. Once I picked the version I liked I received it in just another week. I ordered our print on canvas and I am so glad I did, but I'm sure it would have been beautiful on paper as well. We will definitely order from this company again for the holidays. Very fun products and excellent quality and customer service. I saw this website and just had to get something. 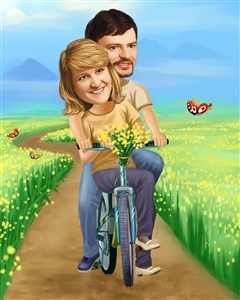 I got a cartoon dawing of me and my wife for her birthday and it turned out great. Love it how they send the final product to you and ask if you like it or not, and if you dont they change it. GREAT,GREAT,GREAT. thought this was a great gift when you are looking for something different. The entire process was very easy to do and I even changed the initial photos I picked with no problem. Was done and I had the gift very quickly! I know my daughter will be delighted when she opens it on Christmas morning! Your service was beyond helpful, the product was perfect and the order was delivered with speed. The recipients LOVED it! Thank you. 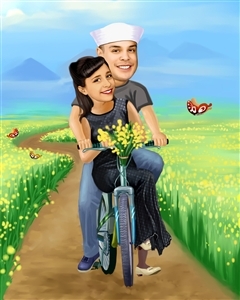 I got this done as a gift for the one year anniversary of the first date with my fiance. He loved it and have gotten many compliments on it. 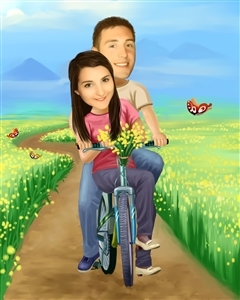 Great job on depicting our facial expressions off the images that I sent you. Will definitely consider ordering from you again!